If you like the smell of geranium (as I do) you will LOVE this (as I do)! We read a lot about handmade natural soaps but there aren’t many handmade natural body washes for those who prefer using liquid soap (as I do 😛 ). 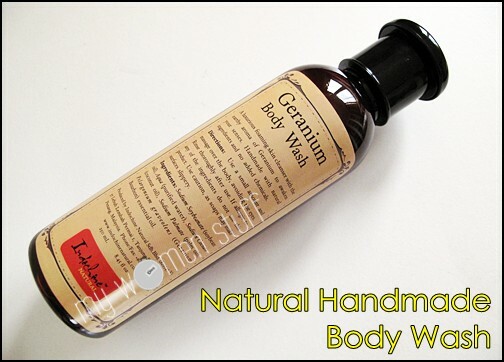 This Geranium Body Wash is the first natural handmade body wash by Indochine Natural. The packaging is sleek and simple and everything you need to know is on the single label. The scent is strong but I love the smell of geranium so I’m happy with it. It leaves my shower smelling lovely after use and it calms me down at the end of a long day so I feel more relaxed before bed. I also like that it is non drying. I don’t leave the shower feeling like I have to moisturize or crack. That’s good news for lazy people like me who tend to not use body lotion regularly. I tried using it as a shampoo as well and I must report that it works just as well – perhaps a little drying for the hair but used once in a while or at a pinch, its great. You would do to pay attention to the label that tells you to “Shake before use”. When I shake it up, the body wash comes out watery but if I don’t, it comes out like a gel mixed with water. I think the shaking of the bottle breaks up the gel. This extra step doesn’t bother me. After about a months use, I do find the smell of the underlying oils getting a little stronger. Perhaps this can be addressed by the company in future? Or this might just be a natural occurrence since its a natural product. A 250ml bottle of body wash is priced at RM26. Not overly pricey to me. Only problem is, you can only get it at very selected places where Indochine Natural is sold. I’ve been using the Star Anise & Coffee. It makes a great scrub! Body Wash Ingredients: Sodium Soybeanate (soybean oil), Aqua (purified water), Sodium Cocoate (coconut oil), Sodium Palmate (palm oil), Pelargoneum graveolens (Geranium Bourbon) essential oil. The Geranium Body Wash retails at RM26/250ml. Indochine Natural products can be purchased at these retail locations but I can confirm seeing them for sure at the Tiny Tapir Baby Store at Ampang Park and Kiosk at Bangsar Village II. Disclosure: Featured Product was provided by the manufacturer for consideration. For posting policies please read my disclaimer. PREVIOUS POST: Smashbox O Glow Intuitive Cheek Color Gel Blush – You Glow Girl! Thank you for the review glad that you like the Geranium fragrance. It is an expensive oil to work with. Indochine soaps are formulated from palm oil and coconut oil. Both are hard oils which will solidify at room temperature. Our soaps are harder and last much longer than other cold-process soaps in the market which uses soft oils like soya bean oil, canola oil, olive oil etc. These soaps are originally marketed overseas with a spice trade theme and it is made in Penang which was once famous for its port in international trading, hence its spicy fragrances. We are coming out with more floral range of soaps and bodywashes in the future to cater for the local market. It takes between 2 – 6 months to develop and test a product before introducing it into the market. We do not take short-cuts in producing our products. Watch out for more products coming. Star Anise and Lemongrass! I do love scrubby soaps. I really like the Star Anise and Vanilla one from Soapy Soaps. Their Macho soap’s nice too. I’ve been very into soaps lately. I actually don’t like using liquid body wash unless I’m in a hurry. Hehe we know all about you and taking showers girl! But I prefer body washes like you,more hygienic esp if you share bathrooms.Since the body wash you reviewed foams up quite well,the SLS content must be high?? Thanks for all the feedback here. I am one of the owners of Indochine Natural and we are always happy to here your feedback and suggestions. 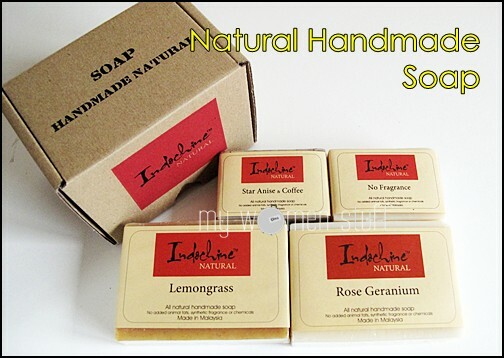 As Allan Lim (our Marketing/Sales Manager) mentioned, we have new soaps on the way. About to be placed on the market is our Gingergrass soap (our consumer testing suggests this will be a HOT item), and on the way is a Geranium & Lavender soap, and a Lavender & Orange soap bar. We are also working on extending our fragrance range for body washes. No short cuts in developing these as our products are 100% natural and are VERY time consuming to develop. Again, thanks for all the feedback, the Indochine Natural team really appreciate it. I love the smell of Geranium! 🙂 I haven’t tried the Aesop balm but it sounds lovely. I hope you like this body wash too. Please review the Rose Geranium soap! 🙂 I love rose scented items! I will! 🙂 Rose Geranium is actually a flower, not a mixture of 2 fragrances. Its got a hint of rose under the geranium scent and I’m interested in that upcoming Lavender Orange line too! For those who are interested, the plant species for the Geranium essential oil used in our soap and body wash is Pelargoneum graveolens, and it is commonly called “Rose Gerananium” because it has an undertone of rose in the fragrance (quite an earthy natural rose, not like the synthetic rose fragrances which are more common in Malaysia). Our Geranium essential oil plants are grown and processed on Reunion Island, which is French island in the Indian Ocean. This essential oil is VERY expensive, at least RM 1,600 kg, but for this fragrance worth every cent!! !